This summer the city of Cincinnati is trying to ensure that no child goes hungry. This is especially critical with Feeding America‘s recent report that over 25 percent of children suffer from hunger or “food insecurity” in Ohio. Free meals for children ages 1-18 are being distributed at a number of sites across the city including Cincinnati Public Library branches. The North Central branch has served 625 meals to children so far this summer. In fact, according to Hamrick, children are discovering new foods like pita bread, green pepper slices, pears and liking them, a possible exception being hummus. 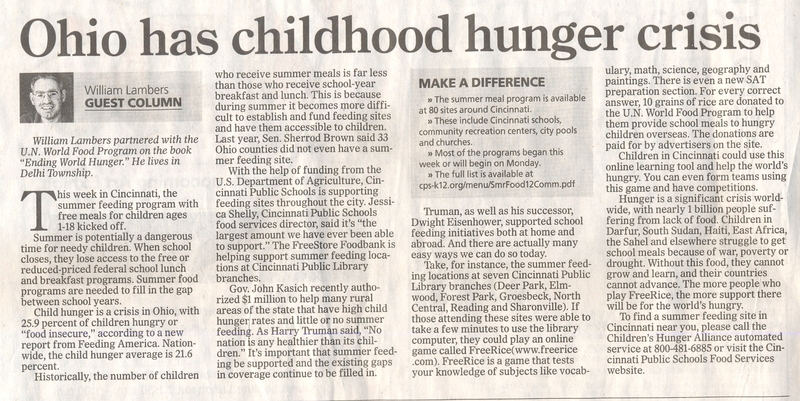 The US Dept of Agriculture, Cincinnati Public Schools, the Freestore Foodbank, Cincinnati Cooks, and other partners are providing the food for these library feeding programs. The link between summer food and reading and learning is strong. Tony Fairhead, the director of Childhood Food Solutions (CFS), works to bring summer feeding to hungry children in the Cincinnati area. CFS provides food to students at the Roll Hill Academy. Fairhead says, “Without summer food, we can’t really imagine the children will be able to return to school ready to learn. I think that summer food explains why we have seen this improvement from 25% to 76% for the vitally important third grade reading proficiency. The charity our Daily Bread, located in downtown Cincinnati, does not host an official summer feeding site but they do have a program called the Kids Club. It’s an after school program for children ages 5-13 and it runs during the summer as well. Children can get a meal, computer access and do arts and crafts projects. The charity relies on donations from the public to offer these programs. Natalie Fields, the manager of the Deer Park library branch, says, “We serve an average of 10 children a day. Happily, some of those children are staying to attend library programs, participate in the Library’s Summer Reading Program, and use the Library’s resources. I’d say our overall library use and program attendance have seen a small increase so far as a result of the Summer Lunch Program. Joan Luebering of the Sharonville branch says, “we do see a few new faces” using the library since the summer feeding began. Ned Heeger-Brehm of the Groesbeck branch library notices some new patrons as well since the start of summer feeding. Denise Scretchen of the Deer Park branch library notes the positive impact of the summer feeding with about 15-20 children attending every day it’s offered. Liz Anderson, the children’s librarian at the Reading Branch Library, says they are serving about 10 children a day with meals. On one day they had as many as 28 children attend. She has noticed some increased use of the library especially when parents arrive with their children. Frank Dugan, the manager of the Corryville Library, said that more kids came to library programs as a result of the summer feeding while it was offered. The Corryville branch, as well as some others, discontinued their summer feeding for lack of attendance. There are issues that need to be addressed to determine how future summer feeding should take place and where. It must be determined why low attendance might occur at one site but not another. In some cases it may just be a case of awareness of the summer feeding availability. With the summer heat though sometimes libraries lose out on attendance. For instance the Pleasant Ridge library branch had small figures of attendance for summer feeding. David Dukart, the manager of the Pleasant Ridge Library, said that they fed 20 children on a few days but most others they were in the range of 4-8 in attendance. However, the nearby Pleasant Ridge Pool’s summer feeding site served 256 meals in the first week of July alone. Regardless of where the meals are offered its vital they are available. With school out children in need lose access to the free and reduced prices lunches offered through the national lunch program. But distribution of food during summer becomes a problem with schools closed. With hunger on the rise in Cincinnati and throughout the country it becomes vital to make sure safety nets are in place for the vulnerable. The need for safety nets like school feeding will become even more important with the expected increase in food prices from this summer’s drought. If you can combine this need with learning it makes for a productive combo. Starting this week the North Central branch and others will also be adding a “backpack” component. This is a special package of non-perishable food that children can take home to use over the weekends when the summer feeding at the library is not available.